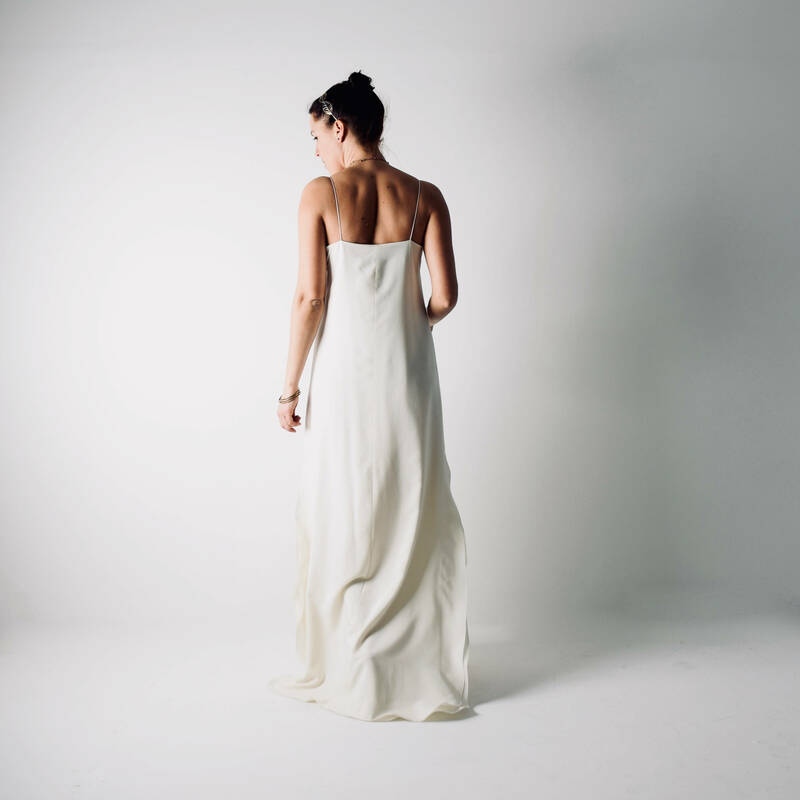 The Saponaria is a simple and refined slip wedding dress. It has a milky, slippery lightness, and it lets your personality shine. Composed of two layers of pure silk Crepe de chine of the highest quality, it drapes smoothly over the body without clinging to it anywhere. Composed of two layers of pure silk Crepe de chine of the highest quality, it drapes smoothly over the body without clinging to it anywhere. Revealing and accentuating your shape. Deep slits open the skirt at each side, and they flow and ripple when you walk. Floor length in front, I cut the back panels slightly longer, with the faintest hint of a train. Just enough to soften the drape and add a touch of flirty romance, not so much as to have it get under foot. You can wear the tunic wedding dress with the smooth satin belt tied around the waist, or you can choose to wear it simply loose and flowing. The belt included is made with a smooth Duchesse satin, and it is finished in back with a long silk chiffon bow, which will trail towards the floor. The belt can easily be personalized, thus changing the style of the dress a bit. If you’d prefer to add some lace, use a contrasting color, use a different material, or have it without the bow just message me and we can discuss options.